We’d love your help. Let us know what’s wrong with this preview of Past Prologue by L.A. Graf. To ask other readers questions about Past Prologue, please sign up. “Past Prologue” by L.A. Graf is the third and final book in “The Janus Gate” trilogy, a series of novels set during the Star Trek Original Series. Kirk is stranded in his past and is trying to find his younger self who is missing in the chaos of a civil war. He is helped by his own father but neither of them realises that 14 year old Kirk is now in the future. 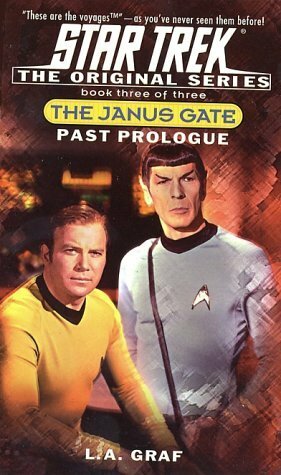 In this future Sulu and Chekov have to work with older versions of themselves to try and find a way to reactivate the Janus Gate to ensur “Past Prologue” by L.A. Graf is the third and final book in “The Janus Gate” trilogy, a series of novels set during the Star Trek Original Series. Kirk is stranded in his past and is trying to find his younger self who is missing in the chaos of a civil war. He is helped by his own father but neither of them realises that 14 year old Kirk is now in the future. In this future Sulu and Chekov have to work with older versions of themselves to try and find a way to reactivate the Janus Gate to ensure that everyone is sent back to their correct timelines. Of course, nothing is ever easy for the crew of the Enterprise and they are being forced to do this whilst an alien race attempts to seal the Janus Gate away for good. I will start by mentioning that this book continues the tradition of this series in that it has a back cover synopsis that doesn’t match what actually occurs in the book. I am quite weary of mentioning this when it comes to “The Janus Gate” as the publishers have been quite consistent in getting it wrong. Whilst any reader has probably already read the previous two books so knows the story and can skip the synopsis anyway it just doesn’t give me a good impression of the publisher. The story that we do get is an enjoyable adventure told at a much faster pace than the previous novel and full of action which kept me entertained right through to the ending. Of course this increased pacing and more action focussed narrative meant that there was less time spent on character development. Whilst this did ensure the excitement levels were kept high it meant we missed the chance to see something really interesting between the two Sulus and Chekovs. A final negative aspect of the novel for me was in relation to the ending. Basically Graf inserts a reset switch type scenario to solve all the paradoxes and fit in with the TV series which never mentions what is seen here. The crew get to continue their journey with no memories of the event and act as if nothing happened. I understand why it was done and was actually expecting it but I still can’t find myself liking that form of ending. ok, so I liked the story, but what exactly did the summary on the back of the book (which sounded pretty good too) have to do with the book?? Kirk wasn't sent back to Tarsus IV and Spock never asked Kevin Riley for help. Confusing. Also, they made a big deal on the front of the book about the story focusing on minor characters. The stories that L. A. Graf writes for Star Trek usually give a good size part to Sulu, Chekov, and Uhura, so this was different how? The 3 books of the trilogy need to be viewed together really. The series improved as it went on with Past prologue being the best of them. On it's own I would give it 3.5 stars. The blurb on the back of the books is not correct bye the way. The crew of the Enterprise must retrieve Captain Kirk from his past, and return his younger self to his place in time. This was a pretty good conclusion to the trilogy. I thought the first two were better though. Also, the snippet about Kevin Riley on the back cover has nothing to do with this book. An excellent finish to the Janus Gate books. Plenty of action and sci-fi possibilities. Good pacing, always held my interest, written well enough to really conjure the original series actors and sets. This may as well be a 3 part televised episode. Hats of to the writer. Let's All Get Rich And Famous.